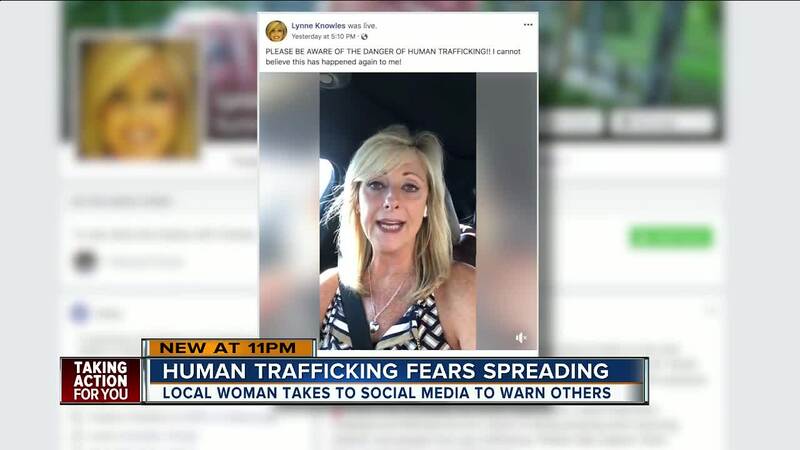 A Pinellas County woman is taking to social media to warn others about a potential human trafficking tactic she recently encountered at a local grocery store. DUNEDIN, Fla. — The woman behind a now viral Facebook Live video says she regrets using the term 'human trafficking' to describe what happened at a local grocery store but does not regret bringing awareness to the issue. Lynne Knowles went live on Facebook Sunday and it has since been viewed more than 3 million times. Knowles described a suspicious man following her through several aisles of a local grocery store, recording her on his cell phone. "Some of the backlash that’s come today about me using the terminology human trafficking has been well taken. As I look back it was a hotbed term that had been used by many of my friends who were aware of the strange happenings in parking lots and grocery stores. I truly was only trying to help. I had absolutely no idea it would go viral. Although I have regret for using the terminology human trafficking, I have absolutely no regrets for bringing awareness to an issue that is happening. There are some very strange incidents that I have not only experienced, but I’m aware of happening also to my friends. Bringing awareness to such can only be a positive. It is my hope that everyone that saw that video utilizes the knowledge they gained to be more aware of their surroundings and to be a better neighbor, be a better person, and try to help someone when you can." Polaris Project says traffickers are more likely use control tactics like sexual assault, withholding money, and isolating victims from friends and family. While the Pinellas County Sheriff's Office says they are seeing more women reportedly being followed by strangers in public places, what happened to Knowles doesn't sound like a precursor to human trafficking. "The word human trafficking a lot of times, you know, strikes a nerve and makes people nervous, as it should," said Sgt. Spencer Gross. Polaris Project reports an increase in human trafficking calls and tips to its hotline in Florida. The non-profit received 410 reports statewide in 2015, 555 in 2016, and 604 in 2017. The Pinellas County Sheriff's Office says it hasn't investigated a human trafficking case in more than 18 months. Sgt. Gross spoke with Knowles Tuesday about the viral video and believes she misinterpreted the term. But adds that her message of staying alert in public places is an important one. "People need to be aware of their surroundings, they need to pay attention, and they also definitely need to report any suspicious behavior to their local law enforcement," said Sgt. Gross.